Happy Spring and welcome to my studio. 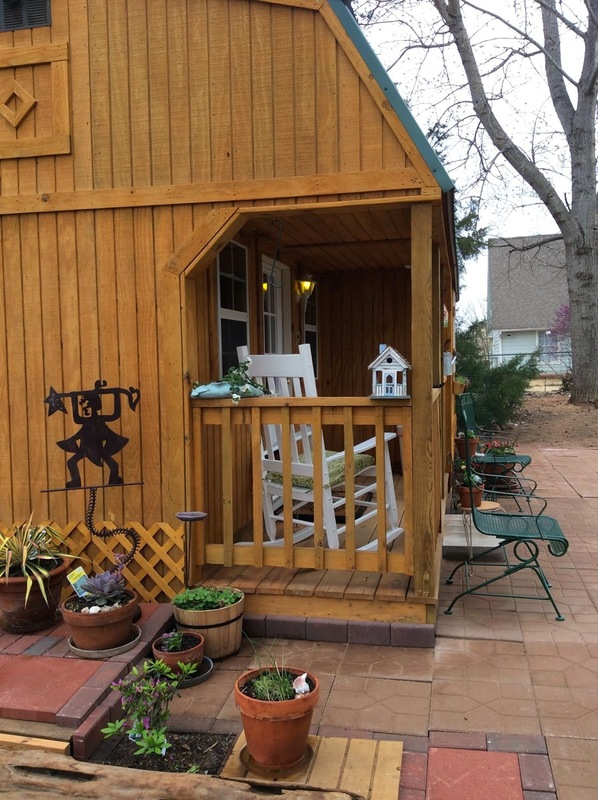 We have been doing some work on the outside and I now have a designated warm weather spot for my morning coffee in the form of a new rocking chair. Never mind that we are under Tornado watch tonight, just another less welcome sign of Spring. Even though the benefits package is spare it is a very nice place to go to work everyday. 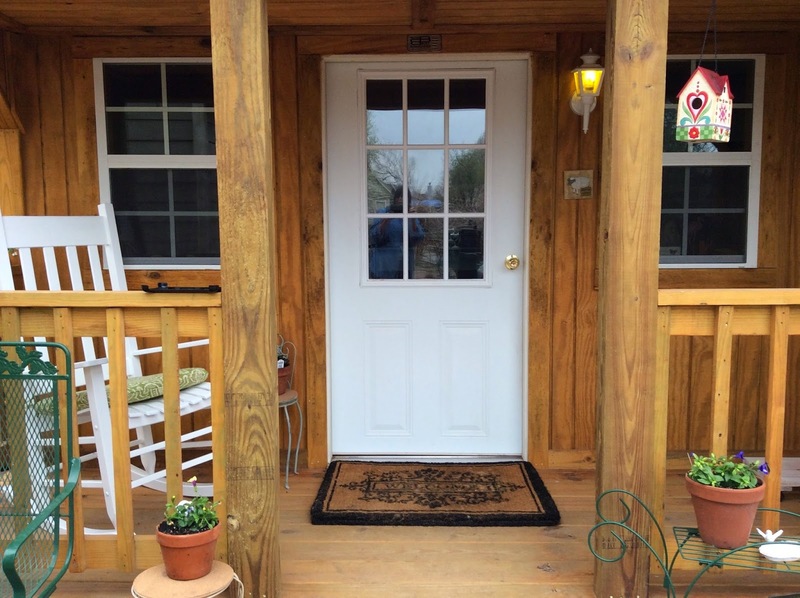 I have been adding to my front patio and it is beginning to shape up. It now goes all the way across the front of the building with places for some herbs, tomatoes and flowers. Laddie is now presiding over his flock of sheep. I have only to weave the hem and it is ready to take off the loom. I have been thinking about how to finish it so should be writing about that soon. 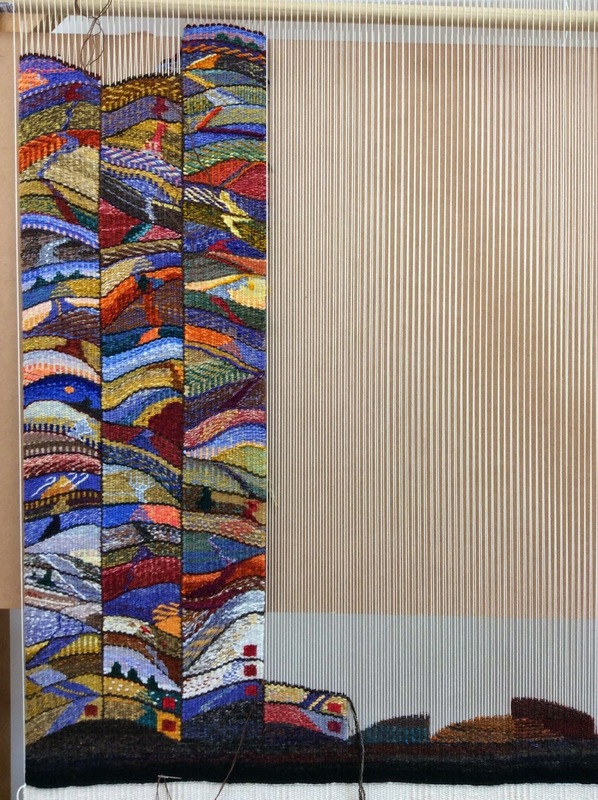 Here are a couple of close up views of the last section of the tapestry. This has been a fun project and each of the sheep is a different breed of handspun wool. I plan to draw a key on the backing for future reference. A new cartoon is waiting to take it's place on the 16 inch Mirrix. 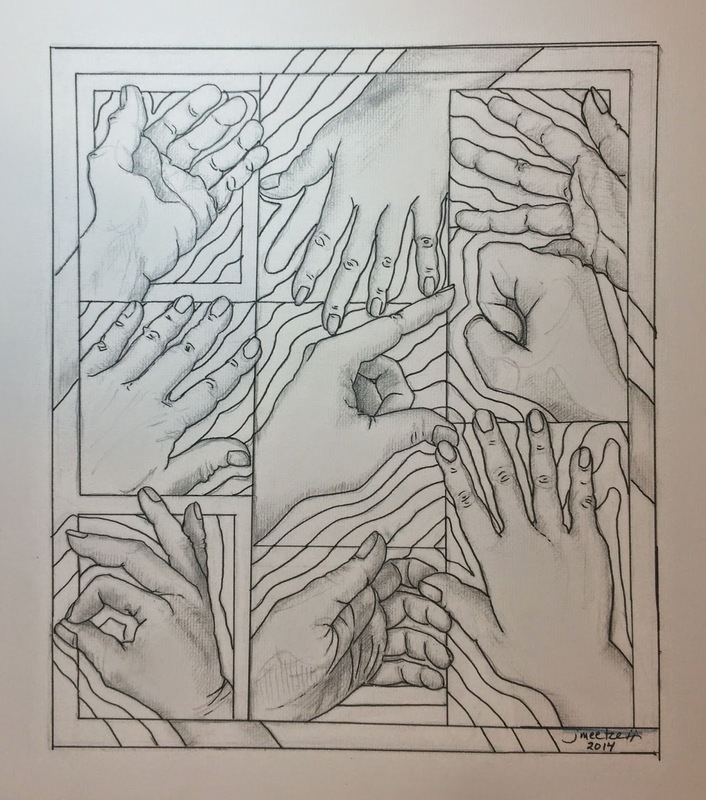 I'm calling it Hands On. The reality about my idea is that it will be quite a challenge for me to design and weave so we'll see what the journey brings. 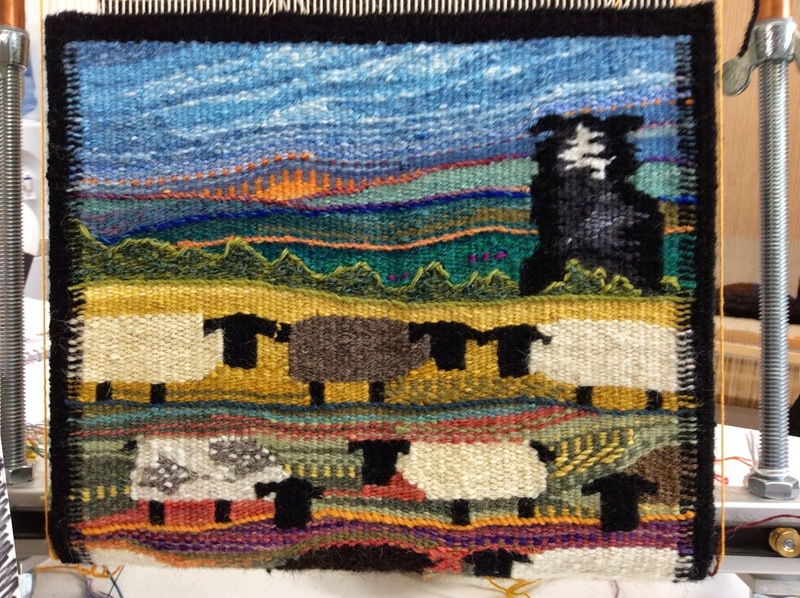 Here is an overall view of the 2014 tapestry diary effort as of yesterday, April 2nd. 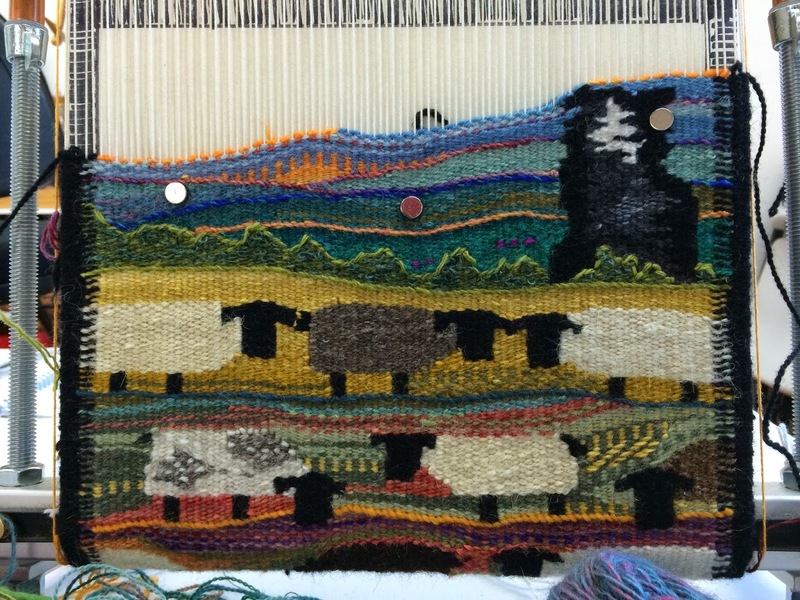 The project this year is based on the idea of following a path or taking a journey through the year and on several days each month I have been using the Mette Lise Rossing book, the Threads Course in Tapestry to try out a few techniques from her excellent diagrams. 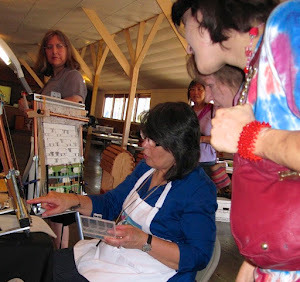 The American Tapestry Alliance is a wonderful organization to promote educational and exhibit opportunities for tapestry weaving. Check it out! Above are some close ups of the first two weeks in March and I went into some detail about the techniques I tried during this time in the previous post. March has gone from snow covered and cold to green popping out all over and much warmer weather. I have really enjoyed trying out some color in plain weave and sumac ideas last month. Soumac is something that I use frequently to smooth a line or for linear effects and there are so many interesting variations to try. On this end of the month detail I have tried a few more that I did not include in the last post. At the bottom the large red orange triangle shape is March 23 and I used variation number 77, page 33 which is two picks of closed sumac going in opposite directions to add a little texture to the grey line of the path with an orange line of plain open sumac beside. 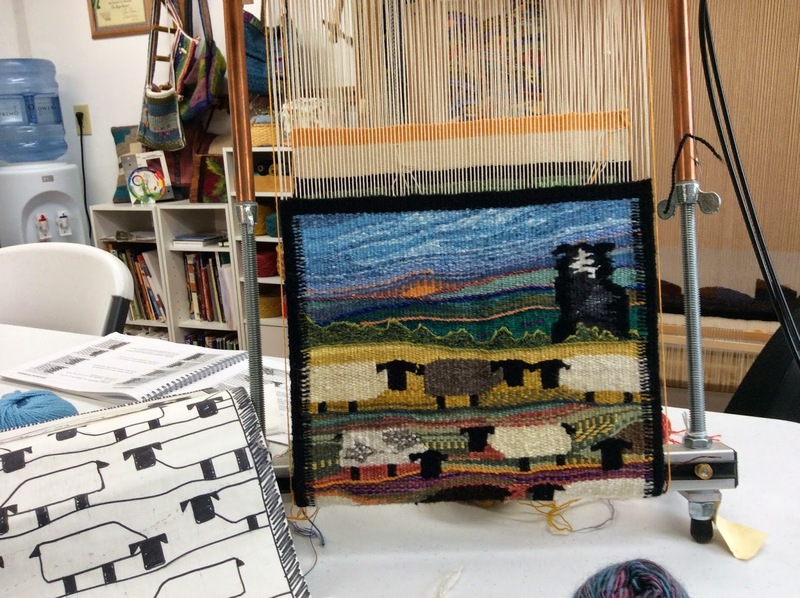 I often use this same technique after or before weaving a hem or turn back on a tapestry. The 24th follows with some twill and ground weave which I have mentioned before and has become a favorite. On the 25th the heavily textured red violet line of the path is a sumac variation 105, page 40. It creates a diagonal pattern by moving four warps for each step and turning twice around two warps. On the 26th the bright orange is variation 99, page 39 which uses sumac as a contour of a diagonal line and turns once on each warp, four forward and three back in open sumac. On the 27th I used variation 101, page 39 and did open sumac turned around with the long floats on the back for the land on either side of the path. This worked nicely and I would like to experiment more with it. If you click on the picture the different texture should be visible in the larger detail. The path is then plain weave with a little blue violet outline. On the 28th through the 31st I continued by repeating some things already used and spoken about. Here is shot showing the end of February, March and most of January together. I thought I would mention again the closed sumac technique that I am using to join the monthly columns. Because one side is completed before I begin adding the other I must put the thread on a needle but if I were working both sides at the same time I would not need to do that. It is variation 57 on page 28 if you have the book. It has an interesting texture and I'm very happy with it in this context. Now, a short pause to toot my own horn. If your ears are sensitive you might want to skip this paragraph. 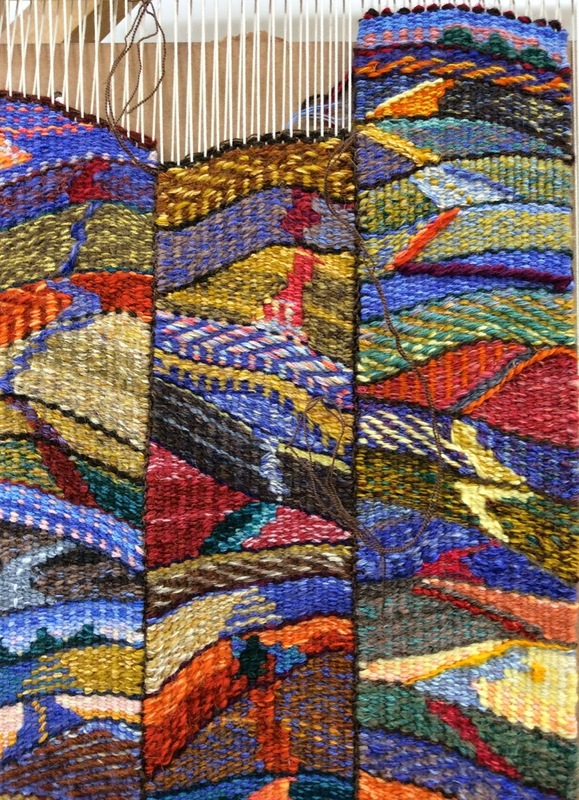 As I mentioned before the Mango Hunters and the 2013 tapestry diary triptych were juried into the Fiber Celebration 2014 show in Fort Collins , Colorado. 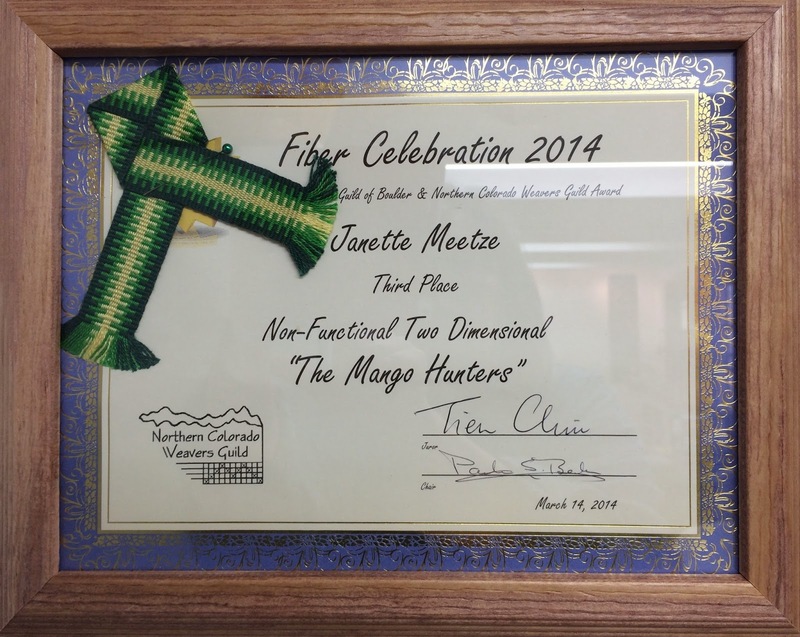 It was presented by the Northern Colorado Weavers Guild and juried by Tien Chou and the Mango Hunters received third place in the two dimensional, non functional category. Quite a delightful surprise! They should both be back in the studio around the first of May.